The 4 bedrooms – 4-bathroom lakefront home is located at the center of Lake Toxaway largest private lake in NC. with over 15 miles of shore and 640 acres. The house is fully air conditioned. There is a beautiful fireplace (firewood included) in the great room. The lake house accommodates, luxuriously four couples, children and also babies. Our maximum accommodation is 8 adults. The master suite has a private room for children and/or babies including single-bed in private room a part of master suite. You have four large bedroom suites, each with sitting areas, all situated in the house SECLUDED FOR PRIVACY for each bedroom suite. The four-bedroom suites varies in size from 250 square feet to 400 square feet. All four bedroom suites have Roku boxes and YouTube TV with all the YouTube TV channels available to you. The great room has a 60 inch Samsung Smart TV, a 48 inch HD TV in the upstairs bedroom suite and 32 inch Samsung HD TV’s in the lower bedroom suite and master suite. Netflex, Hulu, Sling, and other movie carriers are available for all TV’s if you login to your account with Roku player in all bedroom suites and the great room. YouTubeTV is available on up to two TV at the same time. Other Amenities: The laundry room offers a washer, dryer, ironing board, iron, and vacuum cleaner. The kitchen includes and has Stainless Steel appliances and GOURMET FULLY EQUIPPED KITCHEN including full-size refrigerator, dishwasher, microwave, stove/oven, drip and Keurig coffee maker, toaster, blender, eight settings of silverware and dinnerware, basic cooking spices, plus all the gadgets and utensils you need (corkscrew included) and dining room with chairs and table for eight persons. Three of the four-bedroom suites have spectacular views of Lake Toxaway and one has a view of our neighbor’s water stream with water wheel. From our private dock you can go fishing, boating, tubing, swimming, or just cruise the lake taking in the spectacular sights with the 20-foot Hurricane deck boat with 140 HP motor included in the summer June through August. The lake house is just minutes from main Highway (US 64) making going shopping or sightseeing fast and easy. Our location is a short drive to: Blue Ridge Parkway, Pisgah National Forest, Biltmore Estates, Chimney Rock State Park, Gorges Falls State Park White Water Falls & too many spectacular waterfalls to mention, excellent trails, white water rafting & the finest golf courses nearby, or: This home and its location offers everything you could want in a North Carolina Mountain Vacation. I am a mechanical engineer and president of an energy engineering company. My family and I need a place to get away to relax from a high stress work atmosphere. Lake Toxaway and the lakefront mountain retreat is ideal for private relaxation on the largest private lake in North Carolina. We stayed at vacation places nearby at Fairfield Lake in Cashiers NC and decided we wanted our own lake vacation home. Lake Toxaway is the largest private lake in North Carolina and one of the few lakes that the lake level changes a very small. Other lakes levels change because of hydroelectric power plants etc. The house is unique on Lake Toxaway because it has four bedroom suites all with private bath room and three have view of CENTER of Lake Toxaway plus two optional 20 foot deck boats are available at the owners private dock. ALL bedroom suites are remotely situated in the lake house so for couples can vacation at the property. The lower suite has a Jacuzzi an queen bed and a queen hide a bed couch. The master suite has a private sitting room with windows on all sides looking to the lake. The master suite has a private room of it with a couch and twin hide a bed for your child. The upper suite has a large sitting area looking to lake with large flat screen TV. The guest suite behind the dining room has private shower and view of a water fall with water wheel. All four bedroom suites have flat screen TV's and Roku access devices. There is 60 " Flat Screen HD TV in the Great Room with Roku device. 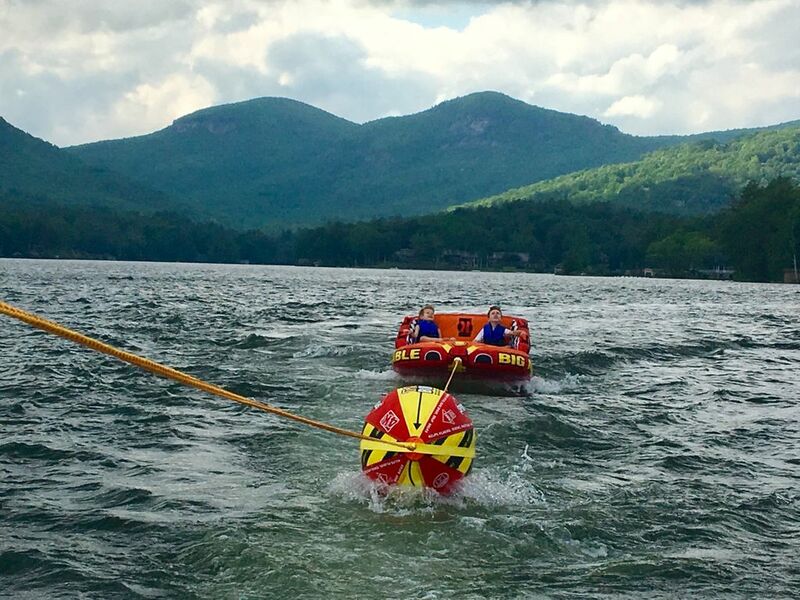 The two optional 20 foot Hurricane deck boats both includes a three person Big Maple tube tow with all the ropes and needed accessories to enjoy tubing. The optional 20 foot Hurricane deck FISHING boat has everything you need to fish with trolling motor, live well and two bass seats. Washer and dryer in room on first level. Large beautiful fireplace in the great wood and fire wood included in rental. Full high speed internet Wi Fi through entire lake house. Living room has great access to center of lake Toxaway. Drip coffee maker and Keurig coffee maker included. Spices and normal cooking need included. Fully stocked with everything you need. Dining room includes large table and chairs for 8 persons. Book library in washer and dryer room. On 3/4 acre property at center of Lake Toxaway. Available to rent at Lake Toxaway marina. 20 foot deck boat included June through August. Big Mable 3 person tow and an additional 2 person tow included 20 foot deck boat available to rent from owner. Ski Sapphire Valley Resort in Cashiers NC 15 miles from lake house. Sapphire National Golf Club open to public 15 miles away in Cashiers NC. This 2,960 square foot contemporary vacation home has all the amenities you'd expect. With four private bedroom suites sitting on the center of the largest private lake in North Carolina, you look directly at Mount Toxaway (elevation 4,100 feet). The master suite has a king size canopy bed and a sitting room with amazing views of the lake. The second and third suites have queen size beds and sitting areas with lake views. The fourth suite has a queen size bed, a reclining chair and television with a view of a rustic mountain stream waterfall and water wheel. There are four baths (one with Jacuzzi tub in the lower suite). DirecTV is in in Great Room and all four- bedroom suites. There is a LCD High Definition TV with DVR located in the Great Room. Also, there are HD LCD TV’s in the master, upper and lower suite and TV in first floor suite. There is Wi Fi is throughout the entire lake house. We just returned for our fourth vacation at the Lakefront Mountain Retreat on beautiful Lake Toxaway. The view of the lake from the great room, deck and bedrooms is incredible! We enjoyed the beautiful landscaping. Several of the trees have colorful spring blooms. There is an expansive common lawn area leading to the owner’s private boat dock where you can soak up the sun. Out back there is a large parking that accommodates 4 big vehicles. The big screen TV in the living room is great! All four bedrooms have flat screen TV’s with Roku media boxes and YouTubeTV app. The quality of the towels is like what you find in expensive hotels. The owner is very responsive to ensure that his renters are comfortable. We plan to return. Beautiful property! Four senior couples had a wonderful time! Only wish the rhododendron had been in bloom. Don't miss "The Blind Mule". As always the house and surrounding property was well maintained with all the appropriate supplies and appliances. The site is located directly on Lake Toxaway which provides beautiful and peaceful views of the lake and surrounding mountain tops from the dining room, lodge room and master bedroom. There is much to do in the area no matter what time of year. We have visited the house several times in the past and always look forward to returning again in the future. Loved it. Can't wait to get back. This is our second long weekend trip to this area of North Carolina. It is beautiful and this house has the perfect setting on the lake with the mountains in the background. The house is large and well fitted. My family had an amazing stay at this beautiful lake house. One of the highlights of the trip was going out on the boat. We look forward to coming back!! So pleased you and your family had a great vacation and enjoyed the deck boat. I look forward to you enjoying the Lakefront Mountain Retreat and boat again. Excellent accommodations with space for everyone. Fantastic location overlooking the lake. The perfect place for a family vacation or just a weekend getaway. I am pleased you enjoyed your vacation at the Lakefront Mount Retreat. Nearby stores include: Ingles (which offers video rentals), Bi-Lo, Food Lion, Wal Mart, CVS drugstore and a shopping center just 16 miles away in Brevard. Several dozen fine restaurants are located within 15-30 minutes driving distance of the Lakefront Mountain Retreat. Golf: Go golfing at the world-renowned High Hampton Country Club or Sapphire Mountain Golf Club – both 15 miles west in Cashiers North Carolina. Lake Toxaway Country Club IS NOT available to renters of this property.